It’s almost here…tax season! And will all the changes it will be a doozy! Now is the time to get your bookkeeping in shape for taxes. How should you do that when you’re a writer and not a bookkeeper or accountant? Carol Topp, author and accountant will show you how! Starting Friday, November 9, 2018 and accessible until the end of the year. This course is for writers who have started earning money from their work or book sales and need to learn how to keep their business records simply and easily so they can get back to writing! This is professional advice from a CPA and author at a great rate! Two pre-recorded video session,. Sessions are 30-40 minutes each. Handouts of the PowerPoint slides. Access to a Facebook group to ask questions of me, the presenter, Carol Topp, CPA. The course officially begins on Friday, November 9th and the entire course is be available to you to access at any time you wish until December 31, 2018. P.S. 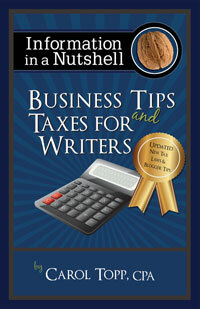 There will also be a class on Taxes for Writers in January! Subscribe to my email list to get notifications.